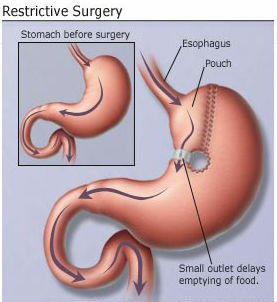 One variation of weight loss surgery. Courtesy WebMD. We’ll begin this post with a story. It involves one of our patients – we’ll call her Deb. * Deb had weight loss surgery (specifically gastric bypass) approximately two years before coming to our dental office. She did not initially disclose this to us (perhaps out of embarrassment?). On examining Deb, we noticed significant dental decay on almost all of her teeth. Some of the decay appeared to be from acid – similar to what we see in bulimic patients. Other areas of decay followed the pattern commonly seen in patients with xerostomia (chronic dry mouth). Her condition was of great concern to us. How could this relatively young woman who appeared to take good care of her teeth have so many dental problems? Many of you reading this probably know how the procedures work. Some of you may have actually had the procedure and are now researching why you are having dental problems. But either way, a refresher is beneficial. 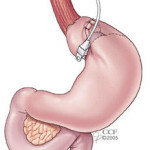 To summarize, bariatric surgery is a group of similar procedures performed on the stomach. The procedures will accomplish one of two objectives (or both): restrict the amount of food the stomach will hold and/or affect the quantity and quality of nutrients absorbed. In either case, weight loss follows the procedure, and resolution of many obesity-related conditions ensues. However, a complex set of physiological changes also occur, and in nearly all cases, dental problems emerge as a direct result. 56% of patients vomit at least once per week six months after the surgery. Nearly all patients experience a decrease in the flow of saliva. While nearly all obese patients experience GERD (gastroesophageal reflux disease), many patients still have GERD post-surgically. And with the ABG procedure, 33% reported having severe reflux – worse than before the surgery. Many patients snack repeatedly throughout the day, leading to a constant barrage of sugar on their teeth and causing an increase in plaque accumulation. 37% of patients report eating increased amounts of sugary foods after the surgery than before. Decay seen on a male patient of ours who had bariatric surgery. He suffered from dry mouth after the procedure. Photos and subsequent dentistry Dr. Nicholas Calcaterra. So, we basically have a perfect storm here: acid on the teeth due to GERD and vomiting, reduced saliva, increased frequency of eating, and increased sugar consumption. The end result is an increased rate of dental decay, often requiring fillings, root canals, and sometimes even extractions followed by dentures and/or implants. Tell your dentist (assuming you haven’t done so already)! Customized trays to wear at night with high fluoride toothpaste (these are similar to whitening trays people will wear – except that you place fluoride in them instead of whitening gels). Acid reflux medications to reduce GERD. Daily use of high fluoride toothpaste such as Prevident. Recommend chewing sugarless gum and or candies to increase salivary flow. If you have had weight loss surgery and are struggling with dental issues, we can help. Call us at (203) 799 – 2929 if you would like to make an appointment. * Deb’s name was changed due to privacy concerns.